Jabra’s new Engage 75 and 65 hardware targets “call-centric” workers in noisy offices. As businesses increasingly embrace mobile working, the need for employees to work freely is more important than ever. But what about those workers who need to be at a desk, or are on the phone all day, such as call centre helpers, financial traders, or helpdesk staff? 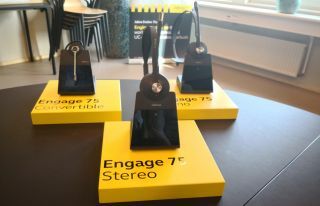 Danish firm Jabra has today released its latest generation of workplace headsets, with the new Engage 75 and 65 range promising a number of major upgrades than should benefit such “call-centric” workers across a wide scope of industries. Available in mono (one earpiece), stereo (two earpieces) or convertible (single in-ear) form factor, Jabra says that the new devices are able to address several major pain points. Chief amongst these is the fact that phone calls are becoming more complex, as workers often need to access detailed information in order to ensure success. This is especially key in scenarios such as financial trading, where a banker may be finalising a high-value transaction - but also in a technical support role requiring precise knowledge to solve a customer issue. With customer satisfaction becoming a key KPI for such staff, the ability to solve complex problems over the phone can be essential to building a business relationship. But being packed into noisy, overcrowded offices can negatively effect on call quality, and it is also these problems that Jabra is now aiming to address. Jabra’s new hardware features a new DECT chipset that allows for more concurrent users within the same space than ever before. The company says that three times as many devices can now be operational within an open-plan office. But users also now benefit from a greater wireless range than previous generations, with the new headsets able to provide up to 150m range. The headsets now also offer battery life to last throughout the working day, with Jabra promises 13 hours without needing a charge. However recharging the devices is quick and easy, carried out by connecting the headset to a USB dock. The new Engage hardware also contains a new two-way microphone set-up that the company says offers “unmatched” call quality, providing clearer, smoother audio. However it also provides advanced noise-cancelling ability, with one microphone listening out for exterior noise and shutting that out. Up to five external devices can be linked to the Engage 75 range, allowing items such as phones or laptops to be connected via Bluetooth, with up to two devices on the Engage 65 line - cutting down even more on the space needed to work productively. The new devices are also more secure than ever, featuring military-grade protection thanks to DECT security level C, and also feature greater physical toughness, with a build of flexible plastic that can survive even high-pressured trading floors. “This is a step into new territory for us...this is probably the biggest undertaking for our company in the last ten years," said Bjorn Ekner, Jabra’s senior director, solutions and alliances.